The iconic image was instead one of the T-shirt shots taken on that sunny rooftop in 1974. 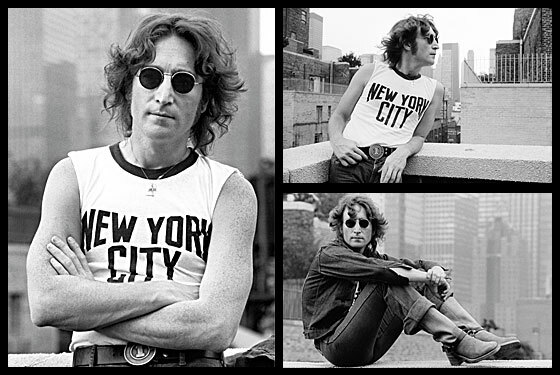 On December 8, 1980, 30 years ago next week, Lennon was assassinated by Mark David Chapman. In the days following his death, Ono was looking for a way for millions of fans to grieve. Promoter Ron Delsener was drafted to organize a vigil in Central Park, and it was he who asked Gruen to choose a centerpiece image. Gruen picked the now famous shot, which suddenly had “a poignancy no one could have imagined,” says Pang. “Because John had fought to stay here and had been killed here. He was very vocal about his love for New York. And New York loved him back.” From that day on, the photo became “so popular there was no way to stop it,” says Gruen.